MRI ACCU-DRAW provides one-handed access to non-sterile vials while maintaining sterility. 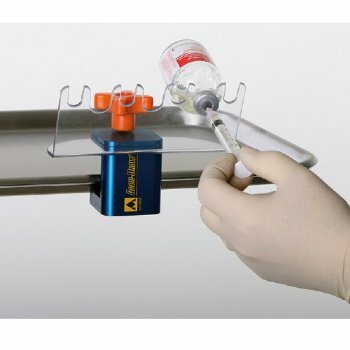 ACCU-DRAW keeps vial labels visible at all times, and angles vials so they can be completely emptied. Eliminates the risk of needle sticks. Made of brass, plastic, and aluminum. Patient Protection The person administering the injections can see vial labels at all times, ensuring the patients receive the intended medication and that the expiration date has not passed. Staff Safety ACCU-DRAW holds vials, freeing nurses' hands. No more worrying if the doctor's aim isn't great. No more getting stuck with needles. Assistants can stay out of the "needle danger zone", at all times. Time Management Why waste time holding vials when nurses have many more important tasks? Now nurses can do what they are paid to do ... take care of patients! How it Works The durable plastic holder accommodates two single-dose and three multi-dose vials at a time. Clamps onto any table surface. Vials that run out can be replaced with fresh ones at any time during the procedure. You know vials are secure because they click and lock into place. Holds vials at the perfect angle, allowing complete emptying and reducing medication waste.